What are you looking at? : She's here! Boy, you guys are a tough crowd. When Frema appointed me Official Blog Updater (for when I arrived home tonight, that is) I suppose we might have mentioned that I'd be staying at the hospital with her. All day. Without internet access. Until I arrived home, which was two and a half hours North of where this precious baby was born tonight. But now you'll forgive all of the madness and waiting, won't you? Because I've returned with pictures! When I arrived today, I was excited to see my dear friend in her normal character. 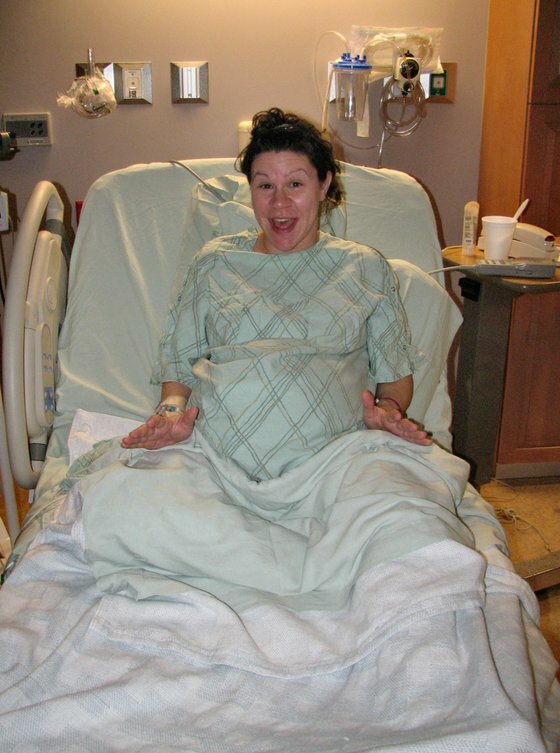 Is this the perfect Frema Does Childbirth picture or what? Of course, then the medical staff went and ruined all the fun with a pretty good Pitocin drip, and I've never seen Bree more focused, or in more pain. She was wonderful, and Luke was an incredible support, but dog-gone if she wasn't in some pain. And then, well, the drugs came. And all was right with the world again. By 2pm there was cheer and double foot rubs and full effacement and eight good centimeters of dilating. We thought for sure baby Freka was well on her way to catching the five o'clock news. But as things sometimes go, progress came to a screeching halt and the baby decided things were a bit cramped, but mostly comfy inside. 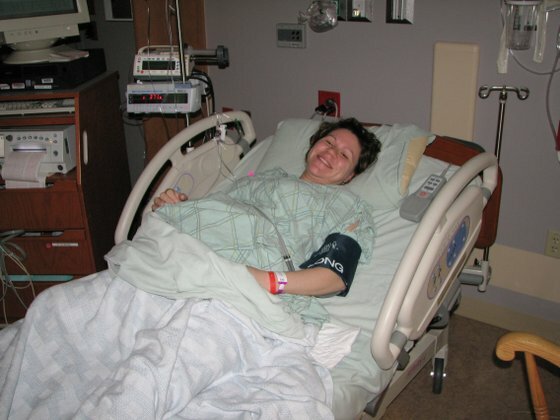 And she stayed exactly where she was comfortable throughout almost fourteen hours of labor, until approximately 9pm, when the doctor assured Breain and Luke that the only way this baby would be coming out would be through a c-section. 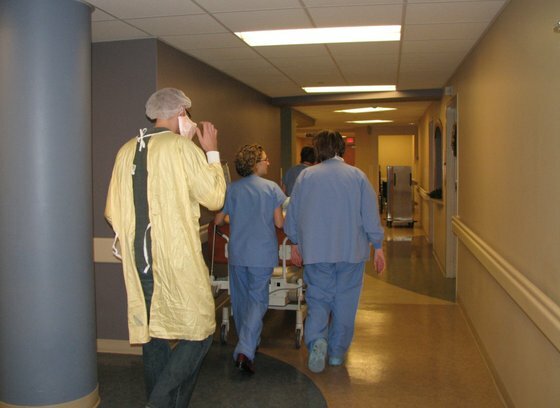 This was definitely the low point of the day, when they wheeled our girl(s) off to surgery. An amazing family of three. At 9:50pm, Miss Kara Leigh arrived, weighing 11 pounds, 4 ounces, and measuring 22.5 inches long, with a smirk on her face and the sweetest chubby cheeks you've ever laid eyes on. 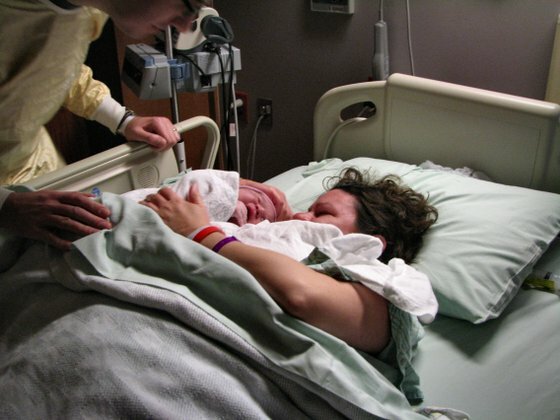 Which should leave no room for questioning the need for a Cesarean Section. My word! I am a long time lurker, but had to post to say congratulations!! She's beautiful. I love the first photo of you all as a family. Congratulations!!! (while I'm up so darn early/late feeding my own little one). She's beautiful and has a beautiful name. And I second that "my word"! A BIG, beautiful baby! First comment?! Guess there are some advantages to being in Australia! Congratulations once again. Welcome, Kara! Congratulations Mommy & Daddy! Good work, on the spot reporter Molly! And let me add to the chorus of WOW. 11 lbs of baby! Mommy, you are a CHAMP. Congratulations! Wow, 11 pounds, such a healthy sized little girl. She is beautiful and you are amazing, Frema. It is 5:30 in the morning and I am blubbering over my keyboard. Congratulations, get some rest! Happy BIrthday, Kara Leigh! Congrats Frema and Luke! I hope your recovery from the surgery goes smoothly, and quickly so you can fully enjoy your little treasure! She is beautiful. I found you on parents and followed you here...I started at the beginning and was so happy to find myself here on this day. Congratulations to you and Luke and to a very luck baby girl. She has a beautiful, intelligent and caring momma who has loved her before she was even a thought! Oh Frema, she's gorgeous, and you look so incredibly happy! What a beautiful family. Lucky Kara! Congrats to you and Luke. Now please...take care of yourself, girlfriend! Thanks to Molly for the update!! Okay. I thought you were a little silly for thinking you may not use the newborn diapers. When will I learn??!??!?! You sure grew that baby good. And I LOVE the name and I am so glad she is here and healthy and that you both are OK. Thanks, to Molly for everything. Our little (or our not so little) Kara is beautiful. Her Grandpa and I look forward to meeting her. Delurking to say GOOD LORD that is one big, beautiful baby! Thank you for sharing this with us. Rest up and love on that smooshable baby girl. Yay!!!! Congratulations to you, Luke, and Kara. She's adorable! I'm just so happy for you all I can hardly stand it. Congrats again. Congratulations! What a big beautiful baby! I like how her name sounds a bit like Freka, it makes it easier to adjust to calling her something else in my mind. The 17 th was a happy day. I am so glad for the joyfull out come. Baby,Kara,Mom and Dad did it the best that it could be done. Thanks to Molly for her support. I know that the Mom really likes not missing any internet time. Thanks to sister Sam. The whole family is now one baby larger. WOW. Such a big (and cute!) girl! HUGE Congrats to Brea and Luke...and WELCOME to the world, little Kara! We promise there's more to do out here, more fun to have, than in your mommy's comfy belly. Just another one chiming in with congrats! I was dying all day yesterday waiting to see when she came! I'm glad everything went well, and I hope you're feeling ok! Congratulations, I'm so glad she's here. I had a c-section too and my recovery was not that bad, I hope yours goes well too. That is some big baby, and she is gorgeous! So happy for your beautiful little family! Molly, thanks for the wonderful update. Such a gorgeous baby, and what a wonderful journey ahead of you! Congratulations, Luke and Bree!!! She is absolutely gorgeous!!!! I am so happy for you both. I cannot wait to watch her grow up in pictures!!! Also, 11 pounds??? Holy crap girl, how did a baby that big come from someone as teensy as you?? Congratulations, Frema! You are a CHAMP. Have a wonderful time settling in with your new family! Congratulations! What a beautiful girl you have! And oh my gosh, 11 pounds from your teeny tiny body? Girl, you did good! Congratulations! What a beautiful girl! :) Great job, Frema and Luke! Now the fun begins.... enjoy every minute. Congratulations on a beautiful and healthy baby! Mazel Tov to you all!! Wow, 11, 4 beats my big baby even. She is so BEAUTIFUL!!! Sweetest congratulations to the new family! She's absolutely lovely! And, thank you Molly for the fabulous update. Congratulations! My labor went a lot like that too. The best advice the doctor gave me about recovering form a c-section is to go down the stairs backwards. Best advice ever. You don't stretch your stomach muscles so much that way. Kara is absoluetly beautiful! Congrats Frema!! Kara's beautiful! Congratulations to you all - you all look so very, very happy. And that video? Totally worth the wait. And a BIG thanks to Molly for the update! Good Lord, what an enormous, beautiful baby! Congratulations! Now the real adventure begins! Best wishes. Congratulations! And oh my Lord what a big girl!!! Good thing you have all those size up diapers!!!! Wow, that's a big baby! For sure she was not going to come out from "down there"! Congratulations, she is just precious! She's beautiful and you look so happy. Congratulations to your little family. What a wonderful gift! What preciousness! I'm so happy for you and your family. And, welcome to this crazy (blogging) world little Kara. Not that you need my validation, but I love the name! Kara is adorable! Congrats to the three of you. You already have the look of an adorable family of three ;) Best wishes for a fast recovery and a long life of happiness together. And oh sweet jesus... 11 pounds of beautiful squirmy baby goodness. You and Luke are the luckiest people ever! No go forth and hibernate with your new little family. What a sweet girl Kara is!!!!!!! Congratulations! I am so excited for you and Luke. And I LOVE her name. She is beautiful! Oh Bree...I just don't have words. Mostly because I'm BAWLING over my keyboard. Congratulations to you and Luke and beautiful baby Kara. She is welcomed to the world by such a loving family and friends, we here at the house of h send our heartiest congratulations and love. From our family to yours. You should be very proud of yourself for the beautiful, healthy girl you grew! Congratulations, love. CONGRATULATIONS!!! Beautiful baby, beautiful name. I'm so happy for all of you! (I'm getting a little weepy here.) I know you're going to be awesome parents. Congratulations! Kara is a lovely little girl. Holy Crap! She's a big girl. And so beautiful!!! Congrats Luke and Bree! And welcome Baby Kara!! Love you guys! Congratulations! She is beautiful and you are a force not to be reckoned with, woman. Enjoy your new family. Congratulations!!! Kara Leigh is a gorgeous name for such a beautiful baby! She is so beautiful, and worth every minute of those 14 hours, right?! Congratulations! God bless your new little addition. Holy Mother of God! 11lbs. You are an amazing woman! Congrats and more congrats! Congratulations! I, too, am a loyal reader of Parental Discretion who followed you over here. I"m so happy for you and Luke. I've loved hearing your pregnancy stories (boy can I relate!) and can't wait to hear about life with your sweet Kara! Way to go!! Oh Bree, she's perfect! Congratulations to you and Luke. I can't believe your itty bitty body was carrying around an 11 pound Kara! Amazing. Just amazing. I hope you are enjoying your first 24 hours with your daughter. Congratulations on the birth of your beautiful daughter! Congratulations! Kara is beautiful. Thanks for making sure we were all updated- we were all excited to hear how things went. Hope you heal up fast! Wow!!! Congratulations!!! Ya'll make a beautiful family. She's a gorgeous baby girl! Congratulations Dunscombe family! She's gorgeous and you all look wonderful! 11 lbs 4 oz. i need to sit down and breath on that for a second. codi is a month old and only weighs 9 lbs 10 oz i can't even imagine carrying 11 lbs. my goodness you are a hero for carrying her around. CONGRATS SHE IS BEAUTIFUL AND SOOOOOOOO CHUBBY AND CUTE. I WANT TO COME AND SQUOOSH HER. Wheee! So happy to see this post! Welcome to the world, Kara! And wow...11lbs...c-section was a good call. Congratulations, Bree and Luke!! What a healthy, beautiful baby girl! You are amazing for carrying an 11 pound baby...and damn straight she wasn't going to come out "down there." You are a mommy!!!!! I am a big baby (ha!) because that post brought a tear to my eye! I love the video so much--thank you, Molly, for being there taking care of our Frema for us! Whoo hooo! Congratulations. And holy CRAP you just gave birth to a 2 month old! Enjoy it! Congratulations!! I am sending you fast recovery vibes and superwoman milk production vibes! I love her name too. I liked the video post - it was good to hear your voice. Yay! Congratulations on your freaskishly large baby! But freakishly in a GOOD way, as she is also freakishly adorable. But eleven pounds? ELEVEN POUNDS? Lordy! I hope you got some 3-6 month size clothes! She is really really beautiful, and you are a superhero. Congratulations again! I love her. Can I say that?! Because I do. She is perfect and sweet and I'm just glad she's here. As a two c/s veteran my assvice: take it slow, but move often. Sleep when baby sleeps, don't run the vacuum, and take any help when it's offered. Congrats again on the arrival of your precious baby girl. I'm so happy for all of you! when I watched that video I just about cried! She is so beautiful, and you can tell you are just so in love! you did great... but now I'm scared... haha my BF was 10 pounds, I can't imagine an 11 pounder! She's perfect. Congratulations! Y'all make a beautiful family. You are my hero! Eleven pounds wow! She is gorgeous. I am totally crying tears of joy for you guys. Also, Leigh is the same middle name we picked, so of course I love it. Congrats on the giant baby! Does this mean her tummy will stay full longer and she'll sleep through the night from the start? Congratulations mommy and daddy! Welcome Kara! She is so beautiful. She looks like she has a head full of hair;) I saw some peeking out of her little cap. Cute, cute, cute! This brings tears to my eyes--congratulations to the whole family, and I can't wait to hear more from the mother herself!! I cannot wait to get home so I can watch that video. Stupid work and their blocking policies! CONGRATULATIONS!! I am so happy that she is finally here! I have not been reading your blog long but have been following along this last month of your pregnancy. Congratulations and welcome to baby Kara! I love when pregnant women say their doctor has told them they are going to have this ginormous baby and they come out of it with a lil old 7 pounder. YOU, my friend, actually came through in the deal! She is beautiful!Congrats! *wipes eyes* wow. Just... WOW! 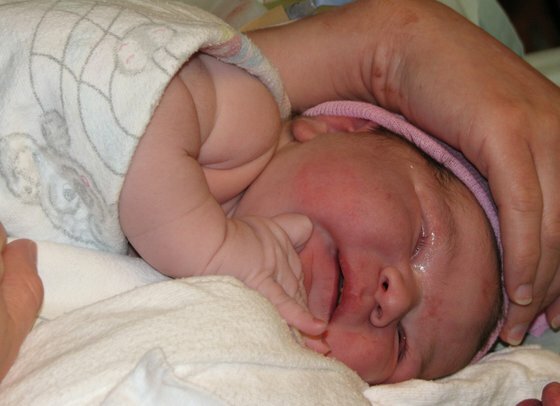 She's beautiful, and you did a great job- 11 pounds, I cannot even IMAGINE. (Maggie wasn't 11 pounds until she was 3 months old!!!!) No wonder she wasn't coming out! Congrats and enjoy these first days!!! 11 lbs? YIKES! I'd be GRATEFUL for the c!! Congrats, what a beautiful little girl!!! Congratulations to all of you! I can't believe she is so big! Wishing you a quick recovery. Also a big thanks to Molly for the update. I've been waiting anxiously. Long time reader, infrequent commenter. CONGRATS on your beautiful daughter! I hope you are recovering from your csection & enjoying your new addition. Holy cow!!! What a healthy baby!!! 11 lbs?!?! Congrats! You guys look so happy!!! 11 pounds?! Wow! That is a big baby for a tiny woman! Congrats to the happy family and well wishes for a speedy C-section recovery! I'm so, so happy for you! Congratulations on your beautiful girl. Congratulations! Happiness! *Weep with joy*! Congratulations!!! I don't think I've commented here before, but I'm so happy that you guys get to experience the joy that is your first child. Also - 11 lbs? oh. my. goodness. Now you know there was a reason for that huge belly. I was just as big as you with each of my two babies and they both were only 7 lbs. They didn't weigh 11 lbs until they were a few months old! Congratulations!! I was directed to your blog by another blog I frequent (Le Petit Chic), and I just wanted to congratulate you guys!! I can't wait to read more!! 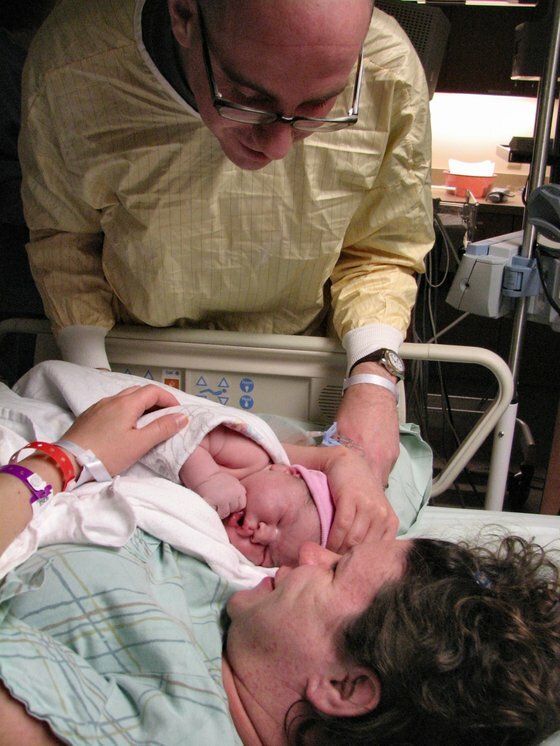 I love reading birth stories...and they always remind me of the day I had my little girl. It's something that you'll never forget. Good luck and congrats, again! Oh, congratulations! She is beautiful! And 11 pounds? You, my dear, are a trooper! I can't wait to hear the full birth story. I'm thinking of you all and praying that all is going well! good grief! 11 pounds? congratulations on the healthy wee one. I just watched the video again. And cried again. She's so beautiful and you're already so deeply in love. Ah mommyhood. It's the best, eh? Christmas Kara! Ha ha! That's a jaw-dropper - 11 pounds. Cheez Whiz, that's amazing. Suspiciously cute for a newborn, too, but maybe she spent the last week primping so she'd be ready for her Internet debut. Congratulations! What a gorgeous, pinchable little baby girl!!!! Good Call on the c - section! Congrats!!! Best wishes for a speedy recovery!! Good Lord - 11lbs! My twins together weren't 11 lbs! Way to Go!!! Wow! Wonderful Wonderful Wonderful job. What a perfect little girl. You guys are so clever! I am 100. congrats and take care.